I would like to give a big thank you to Jenny! 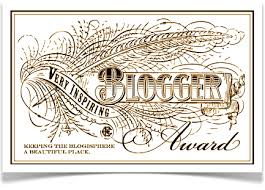 She nominated me for the "Very Inspiring Blogger Award". I did not think my blog or myself was inspiring, but I am glad that I am! You all should really check out her blog, she is really the one who is an inspiring blogger! I am so glad I decided to blog, and it's all because of the wonderful people I have met! 5. Let them know you have nominated them! 2. My middle name is Olivia! 3. I love to laugh! Is that weird? Laughing is really the best medicine. Sometimes I laugh at the most random times. 4. I am a huge Wrestling fan. I love watching it, it's very entertaining and I really enjoy watching it! I also like watching professional basketball! 5. I love to listen to music! Just about everyday I am listening to it, sometimes the time goes by fast because of it. But my whole family loves music too, so it comes natural (if that makes any sense)! 6. I want to become a fashion designer (I love sketching wedding dresses)! Believe or not I actually, started sketching dresses every since I was about 9 years old! 7. I am a winter baby. I was born in December on the 16th! My birthday is a week and 2 days before Christmas, so that's really cool. Hope - Beauty & Bliss! If you do this post, let me know so I can check out your responses!